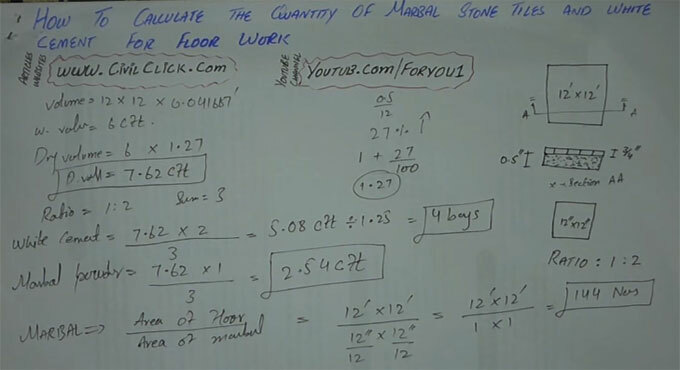 In this construction video tutorial, you will learn the process for computing the quantity of white cement, marble powder, marble stone tiles etc. These construction materials are extensively used in floors and walls as the finishing materials of the house construction. So, it is important to determine their costs. Initially you have to calculate the volume of the area where mortar and white cement will be used. The output is in wet volume and you have to convert it to dry volume. Now marble powder and white cement will be added to this dry volume. Marbel Powder = 7.62x1/3 = 2.54 cft.